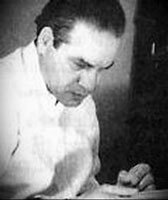 David Lvovich Lvov-Kompaneyets (real surname Kompaneyets, born July 23, 1918, Baku – died 2002, Moscow), was a Soviet composer and songwriter. David Lvov-Kompaneyets was born on July 23, 1918 in Baku. In 1936-1939, he studied composition with Vissarion Yakovlevich Shebalin at the Gnessin State Musical College. In 1939-1945 he served in the brass band of the Moscow Red Banner Infantry School. In the Moscow Conservatory Lvov-Kompaneyets studied composition with Nikolai Yakovlevich Myaskovsky (previously studied with Dmitri Kabalevsky and Dmitri Shostakovich). In 1950 he graduated from the Moscow Conservatory. His elder brother Zinovy Lvovich Kompaneyets was a Soviet pianist and composer. David Lvov-Kompaneyets died in 2002 and was buried at Vagankovo Cemetery in Moscow. For soloists, choir and symphony orchestra – Lyrical cantata Russian Songs (Liricheskaya kantata Russkiye pesni; 1950), for symphony orchestra – Procession (Shestviye, 1946), Symphony (1950), Miniatures for Children (1955), оvertures: Hello, Adolescence (Zdravstvuy, yunost’, 1965), Celebration (Prazdnik, 1970); for a small symphony orchestra, the Festive Waltz (Prazdnichnyy val’s, 1954), the Buryat Dance (Buryatskiy tanets, 1962); for the brass band – marches, plays; for Russian Folk Instrument Orchestra – The Harmonist Plays (Garmonist igrayet), Conversations (Razgovory), Lyric poem (Liricheskaya poema); for violin and piano – Waltz Caprice (Val’s-kapris, 1958), Concert Scherzo (1961); for cello and piano – Poem (Poema, 1937); for 2 pianos – Song and Dance on Turkmen Themes (Pesnya i tanets na turkmenskiye temy, 1951), Morning and Waltz (Utro i Val’s, 1953); for piano – Sonatina (1937), Variations (1947), 8 children’s pieces (1952), Album for children: I (15 plays, 1959), II (35 plays, 1973).